MultiBrief: Can solar energy compete with fossil fuels? The world's biggest solar plant opened last month in California. 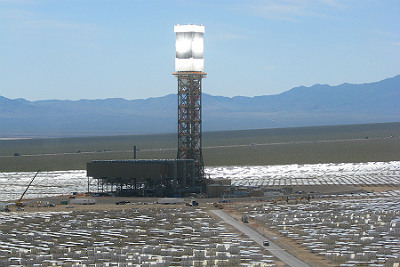 Spanning across about 4,000 acres of land, the "concentrating solar" thermal plant harbors hundreds of thousands glittering mirrors reflecting sunlight on to large towers and heating them up to 932 degrees F. Water in pipes atop the towers turns into steam spinning turbines to create power. Taking more than four years to build and costing $2.5 billion, the Invanpah plant is estimated to produce as much electricity as a coal- or natural-gas-fired power plant. And with tough renewable portfolio standards like in California (requiring electric utilities to generate 33 percent of their energy from renewables by 2020), more of these plants are here to come. According to the Edison Electric Institute, such utility-sized solar plants will soon appear across the United States with 232 under construction, in testing or to be granted with permits. One question, however, remains: Can solar compete with fossil fuels in terms of price? The usual answer to this questions has always been "no." The Energy Information Administration (EIA) estimates that generating power from solar cells will cost on average about 30 to 50 percent more than producing power from coal and gas, for power plants entering into service by 2018. 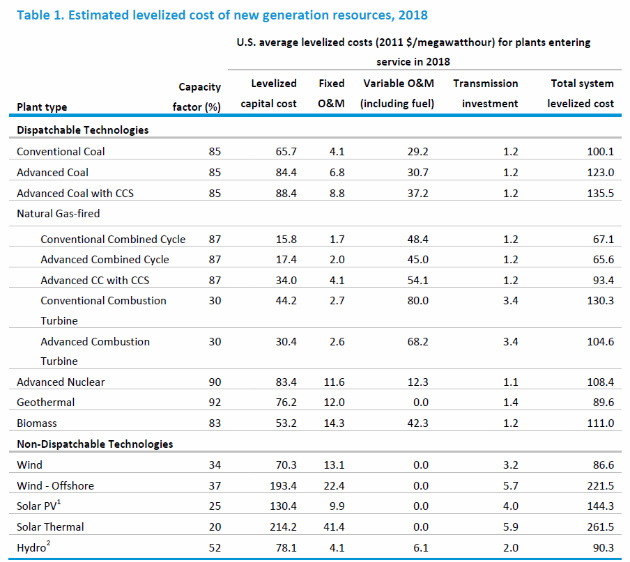 With respect to thermal solar power plants like Invanpah, the cost analysis is even more skewed in favor of fossil fuels with an "estimated levelized cost" of $261 per MWh compared to $100 per MWh from a conventional coal-fired power plants (see table below from the recent EIA Annual Energy Outlook). But these costs don't have to remain that high and depend on how you estimate them — such as the time horizon and methodological assumptions you choose. The usual way to compare the costs of power produced from different sources, is to calculate the levelized energy cost (LEC), the price at which all the costs for building and operating a power plant breaks even with the income from the power generated. This also includes the price of carbon — for instance, the EIA incorporates $15 per metric ton of carbon dioxide that is emitted from new coal-fired power plants without carbon control and sequestration. However, one can also modify this usual way of calculating electricity costs by source, and the outcomes are astonishing. 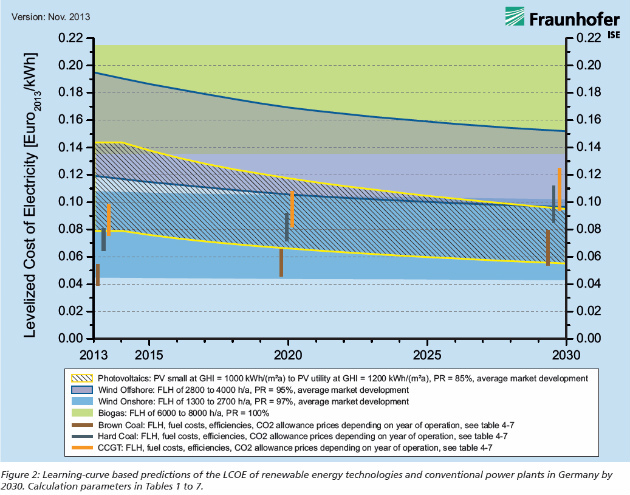 In its recent estimates, the German-based Frauenhofer Institute added a factor of technological advancement, which reduces the average LEC of renewables over time. The result: the LEC of solar cells could compete with gas and coal in Germany by 2030, even under the scenario of low carbon prices and the end of solar subsidies by 2018 (see table from this recent study). This is because historical data shows that technology has reduced the cost of renewable energy by up to 20 percent over the past 20 years and could reduce the costs even further over the coming years. Of course, Germany is not the United States, and the competitiveness of renewable energies also depends on location, how much sunshine there is and the political and economic climate. Still, it is an example that solar power could also compete with oil and gas in the U.S., taking technological development over the long term into account. In fact, signs of this possibility are already there. According to the financial advisor and asset manager firm Lazard Freres & Co., the LEC of wind and solar sources in the U.S. has fallen by more than 50 percent over the past four years. Also, renewables would be cheaper if the estimated carbon price for fossil-fuel-based energy would be higher. This might be obvious, yet organizations like the EIA and Frauenhofer Institute prefer to take fairly modest estimates in face of Europe's failed emission trading system, not to mention the failure to reach a global agreement on climate change. The irony, however, here is that carbon prices like $15 per ton are far below the "internal carbon prices" that are used by the industry for business planning purposes. ExxonMobile is working with an internal carbon price of $60 per ton, Shell with $40 and BP with $40 when it comes to preparing themselves for future environmental legislation. Using such an estimate for calculating the costs of coal and gas compared to solar would turn the picture upside down. Will the price of solar power ever compete with fossil fuels?